At the age of ten, George Chambers served as a cabin boy on a coasting vessel, and was afterwards apprenticed to the master of a brig trading in the Mediterranean and Baltic. He proved to have an innate talent for art, and so impressed local captains and crews with his decoration of their ships, that the owner released him from his apprenticeship so that he could devote himself full-time to painting. Returning to Whitby, he took up employment as a house painter and took lessons in drawing in his spare time. Chambers worked his way on a trading vessel to London in 1825, where he was greatly helped by Christopher Crawford, formerly of Whitby, but then Landlord of the Waterman's Arms at Wapping. His work, hanging in the gentleman's parlour of the inn, proved popular with its nautical clientele and won Chambers his early commissions, although he also worked as a scene painter (1827-28) on Thomas Homor's Panorama of London at the London Colosseum in Regent's Park, and at the Pavilion Theatre, Whitechapel (1830-31). In 1829, two of his pictures were purchased by Admiral Thomas Capel who drew his merits to the attention of other officers including Admiral Lord Mark Kerr. The latter in turn secured him patronage of King William IV and Queen Adelaide in 1831-32 and thereafter Chambers was an established artist. He only showed three works at the Royal Academy in 1828, 1829 and 1838, but many more at the British Institution 1827-1840, the Society of British Artists 1829-1838 and the Old Watercolour Society 1834-1840, of which he was elected member in 1834. 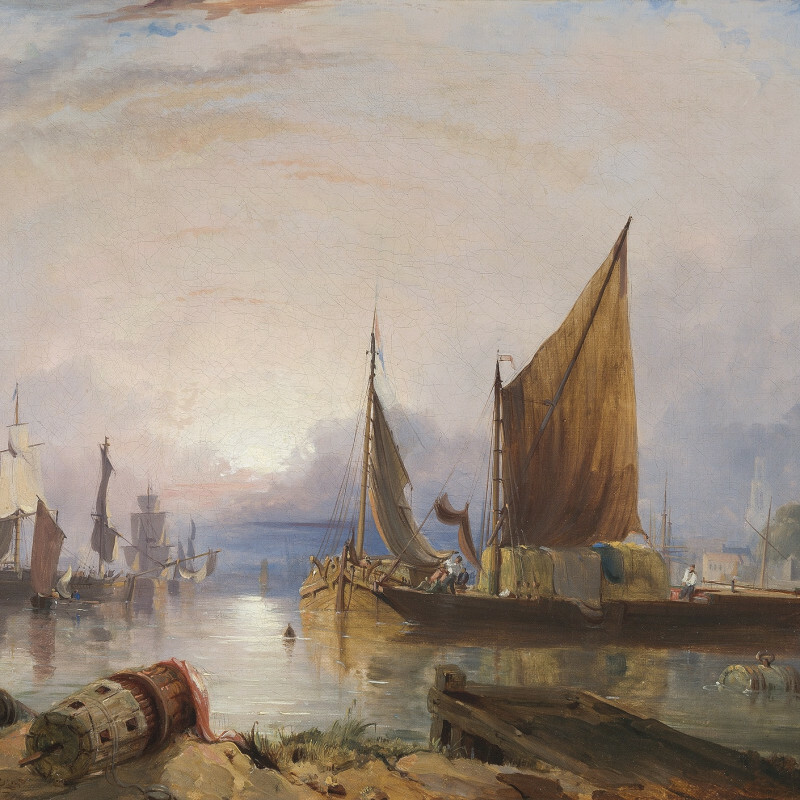 Chambers was a talented draughtsman and watercolourist and an accomplished painter in oils, often working with fluent, colourful bravura in such views as A Fresh Breeze off Cowes and A Dutch Boier in a Fresh Breeze (National Maritime Museum, Greenwich), the latter a product of his one substantial artist tour to the Netherlands in 1837. His most important later 'set-piece' commission was The Bombardment of Algiers, 1816 by Lord Exmouth, commissioned by the Admiral's friends for the Naval Gallery at Greenwich Hospital in 1836 (and now in the National Maritime Museum) probably through the agency of E.H. Locker of the Hospital, Exmouth'd former secretary. He also painted two other pictures for the gallery.